We're happy to announce a new market report, Graphene for the Display and Lighting industries. 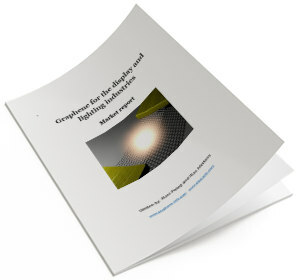 This report, brought to you by the world's leading OLED and Graphene experts, is a comprehensive guide to the applications of graphene in these two important markets. Graphene is an exciting material that promises to revolutionize entire industries - as it provides unprecedented conductivity, heat conduction, flexibility and strength. Graphene has a bright future in the display and lighting industries. Get the report now for $299.99 (single-user license), and $999.99 for an enterprise license - which can be shared with your entire organization. You can find out more information and download the report here.